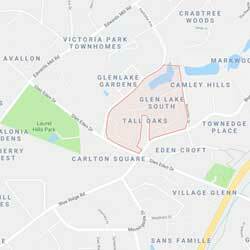 Glenlake South is located in Raleigh, NC. It is a prestigious neighborhood with stately brick homes, townhomes and custom villas. The architecture of Glenlake is the epitome of old world elegance. This is a maintenance free neighborhood with fenced yards, front and rear porches and beautiful landscaping. Glenlake is surrounded by 12 acres of open space including lakes, sidewalks and a rose garden pergola.